After what has seemed like an eternity of not making real progress on our house projects, lately we feel like we've really begun to hit our DIY stride again! Back in our mid 20s, after we bought our row house, we felt unstoppable. We were getting projects knocked out left and right. We had few actual skills and almost no funds, but we felt like things were humming along. Looking back on these projects, they might not have been the most difficult on the DIY scale, but we felt empowered. Those memories give us a great deal of nostalgic fondness. But as we've aged, quickly passing through our late 20s, the staggering blur of our early to mid 30s, and now finding ourselves nearing the pre-dawn of our 40s (or is it the sunset of our 30s? ), our ability and knowledge in DIY renovation is far beyond what it was last decade. But with this knowledge and experience, it seems that our time to complete projects is stretching in duration exponentially in correlation with our advancing age. Let's go ahead and blame experience, attention to detail, professional obligations, and life rather then the inevitable reduction in energy associated with striving for the "over the hill" milestone. Given all of these facts, making real and discernible progress anywhere just seems to feel oh so good! Dare I say, it almost feels like we're a couple of kids again...even if it seems we wake up with more mild aches and pains than we once did. I think this is one major reason why the quick office makeover felt like a huge burst of wind in our sails. 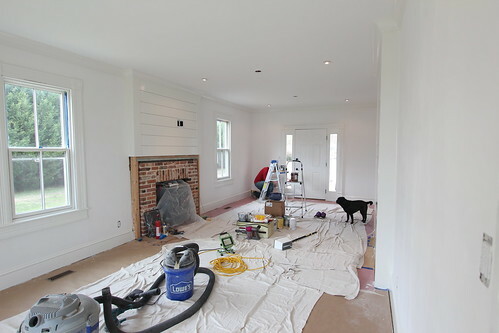 On the other side of the project coin we've been slowly and steadily working along on our big living room project. The various other projects, the limited number of nights per week at our new house, and the fact we're trying to enjoy the house while also doing projects has allowed this project to stretch to a full two years of effort. But all of that effort has been paying off over the last several weeks. 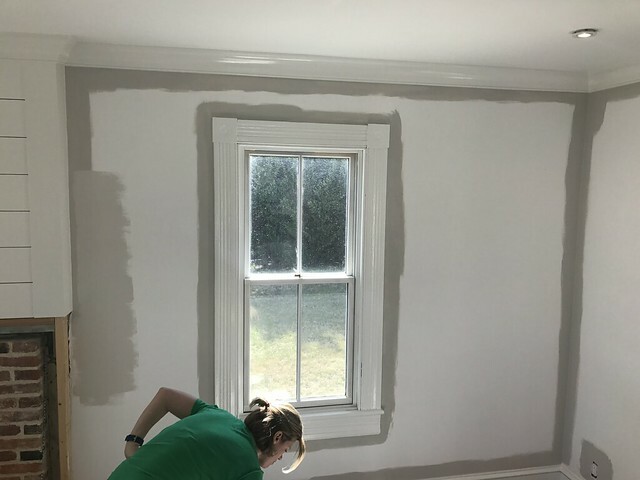 After we finished hanging the two part crown moulding we leapt right into one of the single most satisfying and impactful aspects of any project...PAINT! 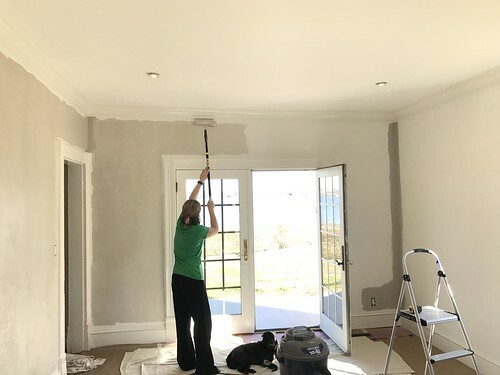 Our plan was to paint the ceiling an ultra flat white, the trim Benjamin Moore's White Dove in ultra high gloss (in their "Advance" paint), and the walls Sherwin Williams' Agreeable Gray in matte. 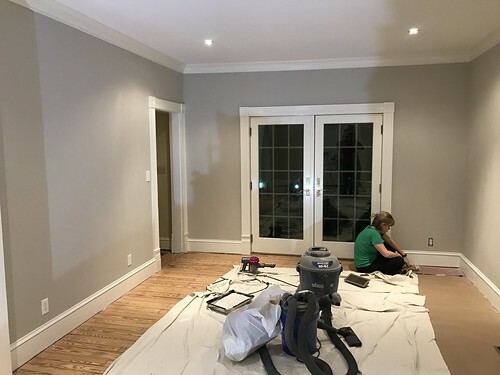 But as anyone experienced in painting a room will tell you, the quality of the outcome of the job is completely dependent on the prep work in getting everything ready. And to prep the room, we wanted to completely protect the beautifully refinished floors by covering every single inch in either paper or drop cloths. After covering the perimeter with paper to protect from any splatter, we laid out drop cloths to cover the exposed middle. 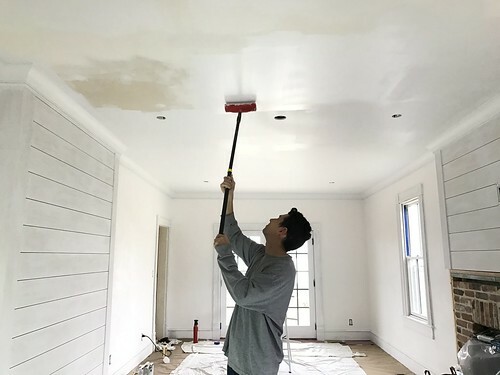 This was a time consuming step, but since we were going to be painting the ceiling, as well as using oil primer on all of the walls and trim, it felt like an important step we didn't want to skimp on. 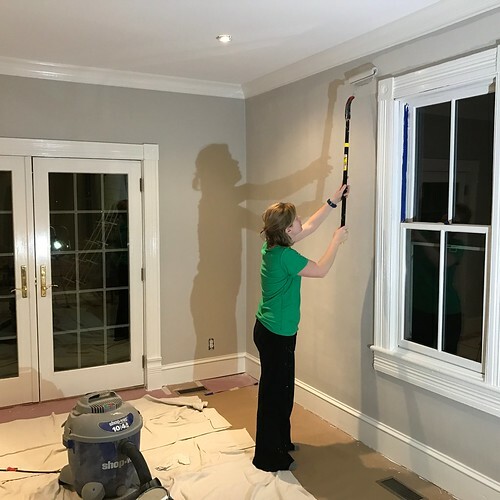 Though we cut in on the moulding and in the corners with the oil primer, we held off on using the oil primer on the walls until just before we were leaving for the week to give the fumes time to dissipate. 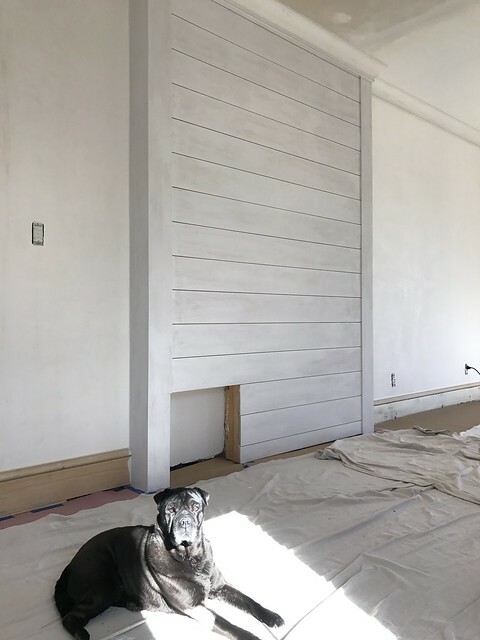 Seeing the room just with a coat of primer on the cream moulding and raw shiplap made me really start to fall in love with this room. Alex turned his attention to the thankless and neck ache producing job of ceiling paint. I started by cutting in around the crown and he followed with a roller. While this blog post may well be giving the appearance that this was a quick job, let me assure you that this was a several weekend day and night endeavor. So please don't be mislead by the Internet based illusion that we knocked this out in a day. Soon after we were done with two coats of paint on the ceiling, we moved onto priming all of the walls with oil based primer. 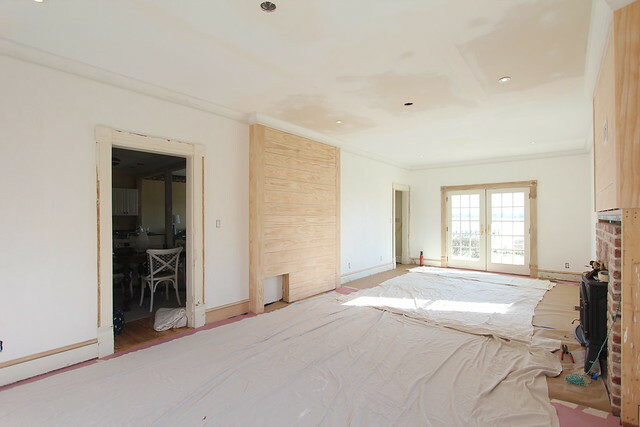 We used oil based primer since it is recommended by Master of Plaster over the fully cured lime based plaster walls. I have to say, the oil primer certainly takes a little getting used to. It doesn't feel like it rolls on quite like the same way latex primer does, and each dip of the roller just doesn't feel like it holds quite as much paint. We were using Sherwin Williams fast drying oil primer, so I can't say if a different product would go on easier. As everything turned white from the primer we turned to painting all of the trim and our excitement continued to build! The room was fast becoming an actual room and we could see it slowly coming together. 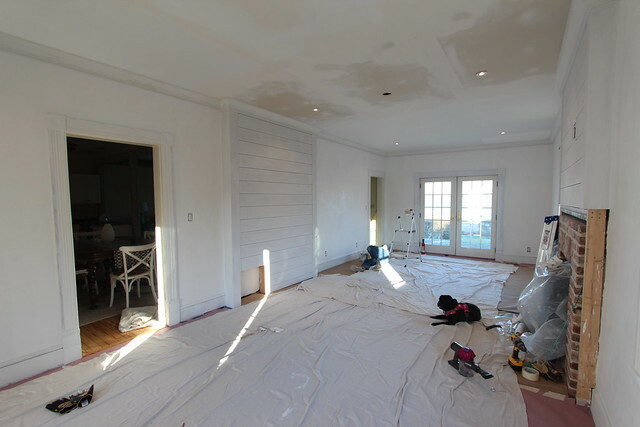 When it came time to paint we followed the old tried and true approach of top down, ceiling then trim then walls. All the while we divided and conquered. Alex worked on putting two coats on the crown while I worked on doors and trim. After two coats of paint on all of the trim and shiplap, I was a little concerned that the White Dove trim paint was looking a little too creamy against the very cool white walls and ceiling. And then I started to second guess painting the walls in a warm gray. Are gray walls already a thing of the past? 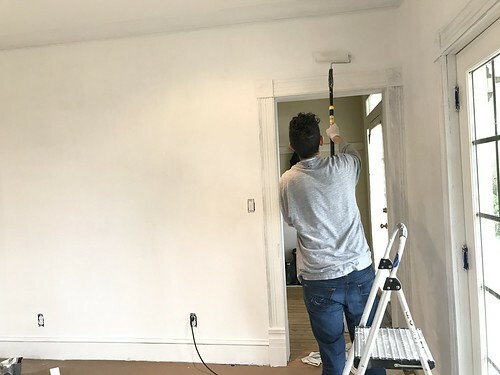 Aren't all the cool kids these days painting their walls white? Ugh. But heck, I've never been one to follow the latest trends and given the size of the room, ultimately I decided the room would feel too sterile if left all white. I don't know if you do this when you choose a paint color, but I'm always a little concerned I've made a terrible decision when we're half way through painting. And like a very bad spouse, I voice this concern and just end up making Alex crazy. Every single time I feel a little like Lucy pulling the football away from Charlie Brown, but every single time I wonder why Char...errr, Alex seems to fall for it every time. Shouldn't he know better by now that I'm always just a little paranoid about my color decision in the moment but almost always end up loving it when it's done? Anyhow, we got to work painting the walls with the Agreeable Gray. 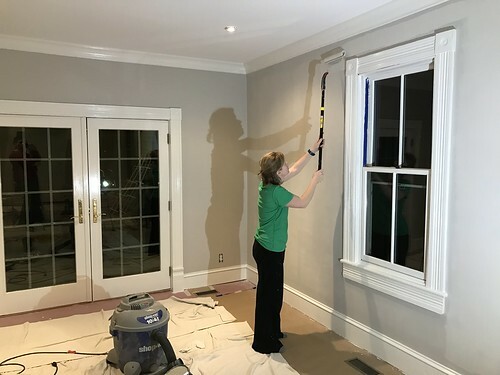 Alex wanted to cut in around the trim and in the corners with two coats of gray before we started rolling the walls. But he was taking a little while to get it all done, and this was another day and night endeavor, so I sort of jumped ahead. 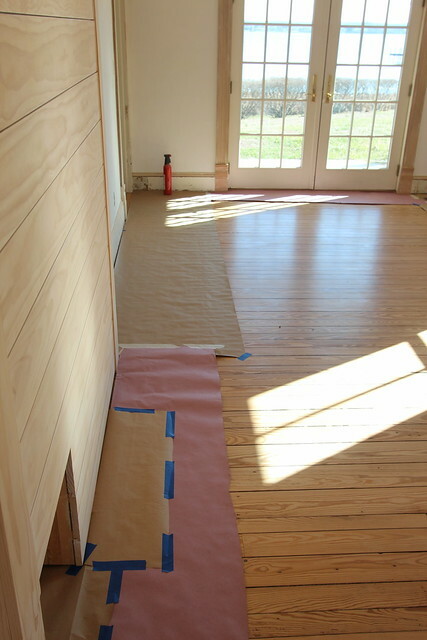 We agreed, I could roll the first coat but we'd have to do two coats of cutting in before rolling the final coat. We did essentially finish the first half of the room which gave me a great feeling for the final look. My concern that I had made the wrong choice began to quickly fade as I saw the final cured color. Boy was it fulfilling to see it all coming together, but also exhausting. Total time for painting ended up taking about three of our weekends at the house. It also helped to remind us why we I think we spent much of our mid 20s so very tired. After the final coat had been rolled we had our moment of truth. We began rolling up the drop clothes and peeling up the paper around the room to reveal the floor and how it would look with the gray walls. To put it simply, I loved it! Alex loved it! Lulu even loved it! It was all looking so great. We even installed the light we'd been planning for the "entry area" near the front door. Seeing it in the daylight only further reinforced that this was the right decision. 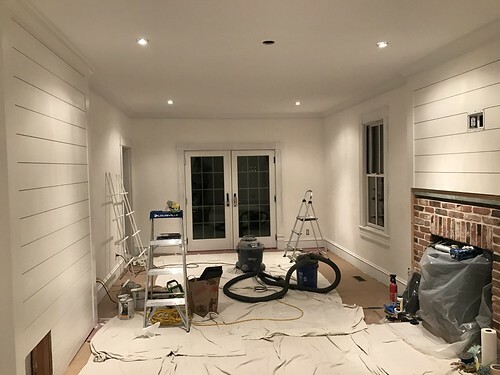 As you can see, we still have to install the shoe molding and do a few small paint touchups, but we are essentially done and ready to start loading in the furniture and decor. We even started to play around with art and accessory placement, using items I purchased ages ago for this room and have been storing in the attic for what has felt like eternity! 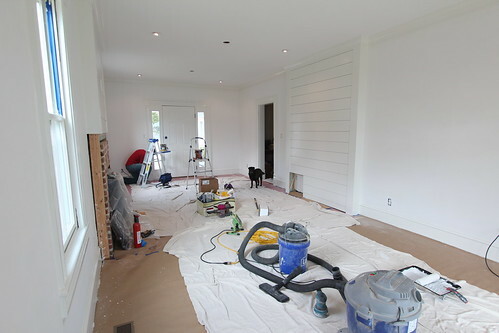 The paint we used for the trim is all beautifully glossy, and the wall just the right texture. 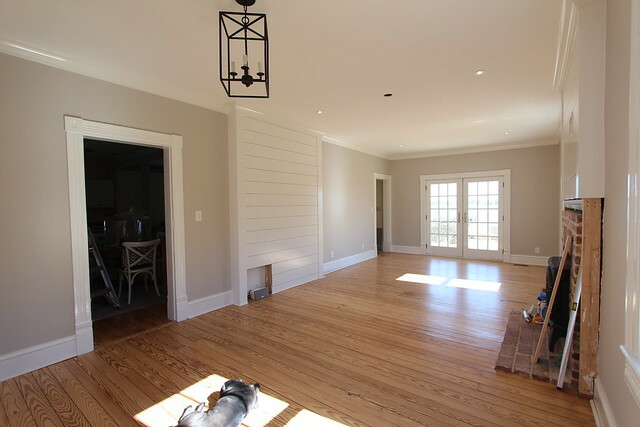 We still need to build the fireplace mantel and trim out the little nook at the bottom of the shiplap, but we've got ourselves a real actual room. And for good measure and as a reminder of just how far we've come, here's a look at what the room looked like when we started this project back in (cough, cough) 2014. 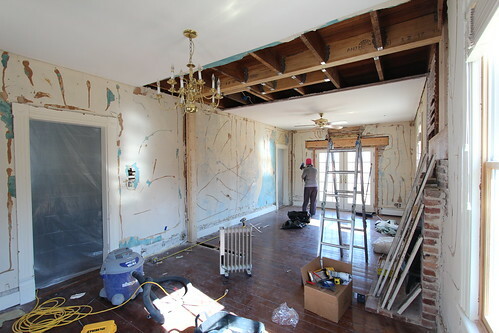 And a look at the room while we were in the thick of the messiest parts of the renovation. 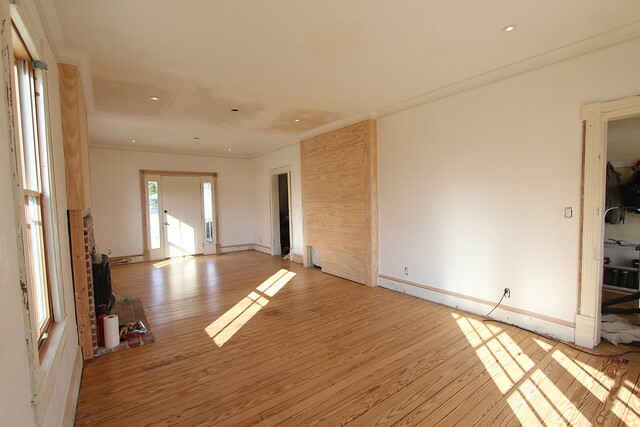 We can't wait to share photos of the room in all its completed glory. 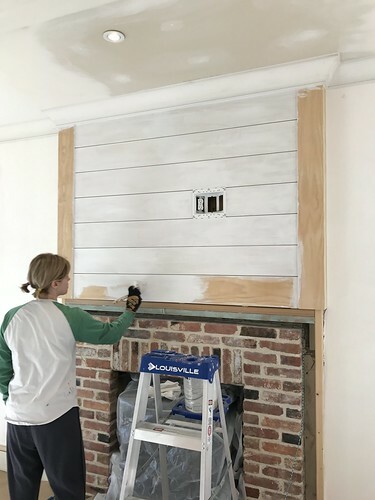 There are still a good number of items left on the to do list, especially when taking into consideration that we need to build a mantel from scratch, but everything is really coming together. The coolest thing about this project is that it was really given both of us amazing energy to complete this project and get moving on the next one. Amazing! I definitely know how you feel with the "things are taking forever" emotions. My husband and I are currently in that stage. I can't wait to get the satisfaction of painting. 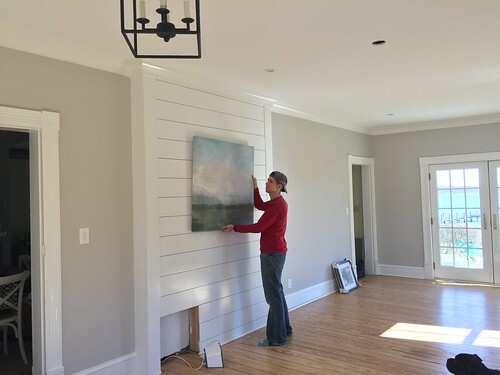 You are SO right, it is both the quickest and most impactful way to make a room seem updated! I'm so glad we're not alone! Best of luck with your project and I hope you get to dust off your paint brush very soon. I didn't even have to wait for the "after" pictures to know that it would look great! 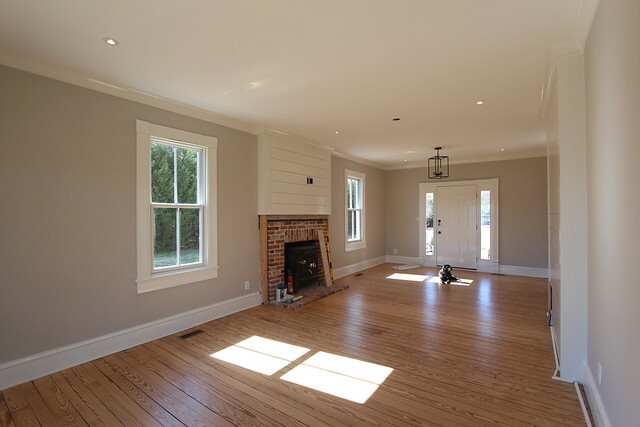 I happen to have agreeable gray on my living room, hallway and kitchen walls, and I have similarly treated wood floors in my 1860s shotgun house on Capitol Hill. 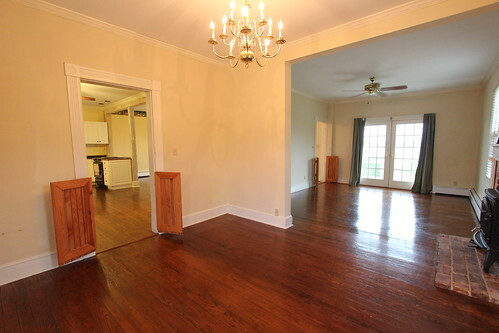 I am excited to see how this room (and the house as a whole) come together. Thanks for sharing. :) Thanks, CM! We're thinking about using this color throughout a lot of the house, just like you have. It's such a nice, warm but neutral backdrop for a room's design. Thanks so much, SH! The transformation and the natural light in the room is incredible (Lulu's one smart lady), and is really helping us feel excited about what's to come. And being ready for "the season" is definitely something driving us to push well into the wee hours. Beautiful!!! Can feel all your hard work and pride in your post. Is that the Ballard Designs light fixture? Thanks, Margie! It's been a long road but we finally feel like we're nearing our destination. And yes, that's the Ballard Designs fixture. If I lived in Cincinnati, I think I'd be there several times a month. What a great resource (and thanks for introducing us to it)! This post was so spot on! I was nodding my head the whole time reading it. I love seeing Lulu pop up in some of the photos too, I'm sure she loves her new living room. Thanks for your honest reflections. Sometimes, some folks make projects seem super easy, with no regrets or worries. It's not that I like to hear of failures, but it is good to know that failures happen to everyone and how you recover is part of the learning curve. Your room is huge, lots of hard work, BUT what great results! Bravo! I really appreciate you comment, Susan. I'm glad "the struggle" is evident in our posts. ;) DIY renovations aren't what television and some blogs make them seem, and while we want to encourage folks to tackle projects themselves, we also want to keep it real. I'm sure the high gloss trim on the new shiplap and crown looks amazing, but how does it look on the original molding? I know you stripped your old town home's molding, so bumps have bothered you in the past. That's an excellent question, Susan, and something he and I discussed at length before moving forward. Luckily in this house the molding is in better shape, but we did address some of the rougher or damaged areas by replacing sections with new (milled to match the old), patching with wood filler, scraping any peeling paint, and sanding. Even though he didn't strip it, Alex spent a significant amount of time on prep. 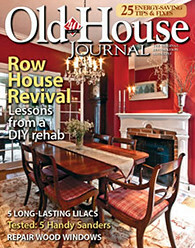 We're really happy with the results in that they look beautiful, but there's still some character that shows the home's age and the fact that original details remain. Beautiful! Another step closer to having your house a place to play, rather than work. 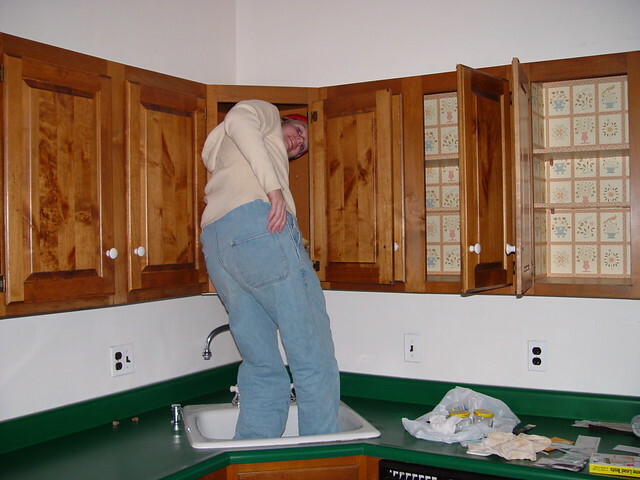 That picture cracks me up - Feet in the sink, head in the cupboards! Been there! Looks great and nice write up. I so identify with 20s vs near 40 and all of the other things that demand your time. Mostly for my comment - (so much i identify with) Sonos is not a contructiom radio! Something I know inimately... Sonos is awesome and sonos feels beefy and your careful etc but one of ours (a play 5) failed to survive being moved around as it sadly simply stopped working and required a costly exchange post warranty - may not be related as i was so gentle but truth is it was moved room to room and replugged and was on the floor.. and it quit. Looks great!! I selected Agreeable Gray for my first floor and we are so happy with it! It's very calming. Lulu is such a cutie!!! Beautiful! Love the post. 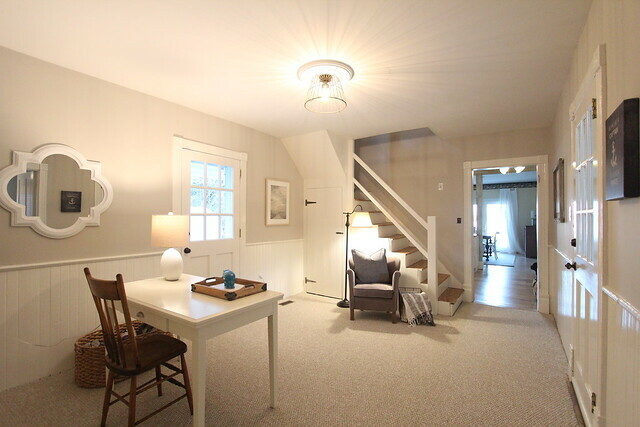 I’m having a hard time deciding on paint for my living room and hall but was leaning towards agreeable grey. I came across your post and also like the color on the walls of your office. Could you tell me what that color is?